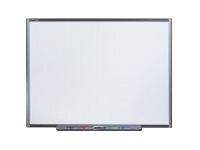 Your SMART Board M600 series interactive whiteboard is durable and reliable. It features a rugged, hardened interactive surface, two damage-resistant pens and SMART's proprietary DViT (Digital Vision Touch) technology. Four digital cameras, one in each of the interactive whiteboard's corners, track the position of your finger or the pen as it moves across the interactive surface. Your interactive whiteboard supports multitouch gestures. You can use two fingers to resize an object on a page, to rotate an object, to zoom in and out and more. Your interactive whiteboard supports dual touch. Two users can use their fingers to simultaneously perform mouse functions or write on the interactive whiteboard. If adding brackets or accessories the above prices will each increase by £5. Pricing based on delivery to a ground floor location or non-ground floor via lift, customer is responsible for pallet disposal. End user details including full name, address and contact details required for ALL Smart orders. Delivery of AV equipment to point of use. Based on level access and the use of a lift. The following remote areas by POA quotation only - AB, PH, PA20+, DG, TR, PL, TQ, SA, IV, KW, Eire, Northern Ireland and offshore Isles. Remote areas, awkward site access, stair walking, 3 or 4 man jobs, and out of hours running by quotation only. Site surveys MAY be required at a cost of £150.